A senior leader at Barrow Borough Council has blasted the “unreliable” Class 37/4 diesel locomotives that operate a limited number of passenger services on the Cumbrian Coast line for diminishing the line’s appeal for commuters. Speaking exclusively to RAIL, Brendan Sweeney, Vice Chair of Barrow Borough Council, said the ‘37s’ – which have been operated for Northern by Direct Rail Services (DRS) along with a rake of Mk2 coaches and a Driving Brake Standard Open (DBSO) since 2015 owing to late cascades of DMUs from other parts of the country – have “been a disaster”. At present, DRS has a contract to provide Northern with two sets of locomotives and carriages until January 6 2019. 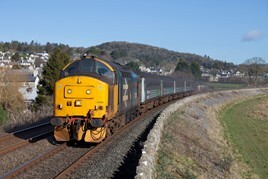 DRS/Northern introduced top and tailed Class 68s on March 12, replacing one '37'-powered diagram. For the FULL story, read RAIL 849, available now. Good old councilor, never happy. you can't have it all ways, the amount of money it would cost, and time, to upgrade the DBSO for multiple working with the class 68 isn't worth it for either Northern or DRS. He should be glad there is at least a train service, it would be easier for Northern to say "sod it we can only do a 3 times a day service"
I have just spent the day traveling on the cumbrian coast line. 1 class 37 5 mins late another observed on time. Class 68 train on time. Caught 2 class 153s one 10 mins late the other 45 mins late. The next one cancelled. 2 coach 153 uncomfortable noisy. Busy. Loco hauls quiet smooth plenty of room 4 coaches.subs 20 extra passengers revenue rail enthusiasts. I presume this person has never travelled by train. What he ought to be doing is asking why is it that London gets many times the investment in rail per head of pipulaytion. With billions being spent on orders for new trains for guess where? You just can't please some people, can you? Superior ride quality; massive window area to admire the scenery, and everyone gets a table. Not good enough? Maybe it should be timetabled as a heritage train, with a £5-£20 supplement payable, depending on the journey! Class 68 are also noisey and Smokey.